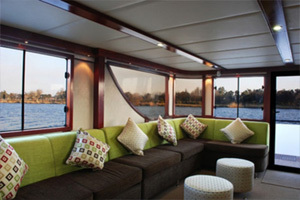 If you are looking to stay in a houseboat on the Vaal River, you are in the right place! Liquid Lounge not only offers spectacular river cruises on the Vaal River, but luxurious houseboat accommodation in the Vaal Triangle too. There are different option available when it comes to our houseboat accommodation – Read more below, or simply contact us for more information about our accommodation options and rates. We trust that you will truly enjoy your stay onboard one of our beautiful houseboats – watch the sun set over the river and relax with the beautiful scenery and atmosphere. 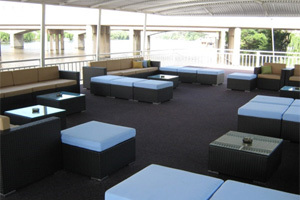 Contact Liquid Lounge today for more information. 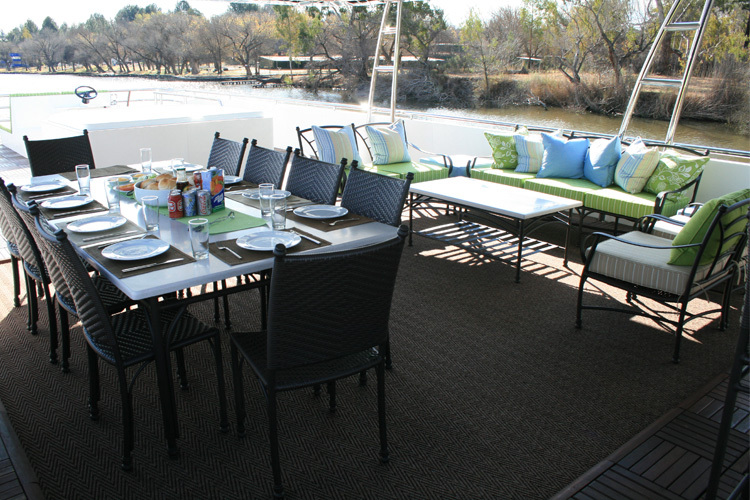 Liquid Living offers comfortable and luxurious houseboat accommodation in the Vaal Triangle that is suitable for up to 10 guests. 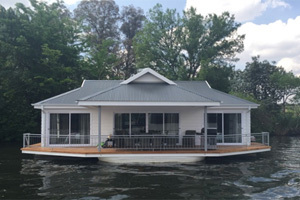 The houseboat features four luxurious double cabins (en-suite with a shower, basin and toilet), making it perfect for a weekend getaway with family and friends around the Vaal River. The Saloon area features a large plasma television, comfortable lazy-boy lounge suite, and a sleeper couch . 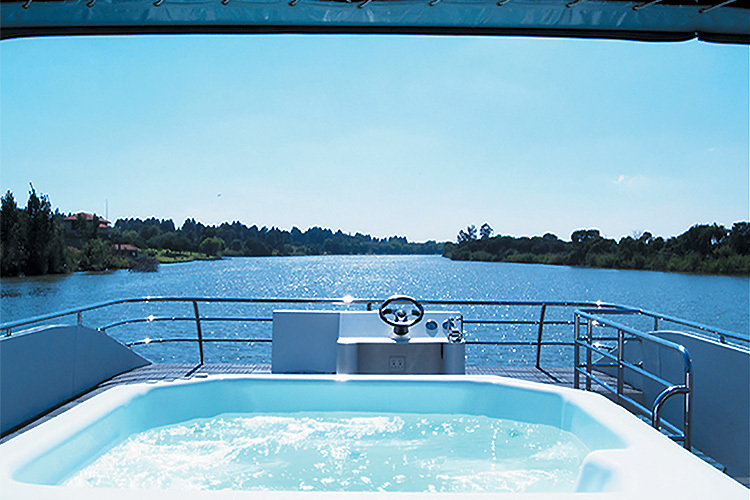 Relax in the cold water Jacuzzi while enjoying the beautiful surrounds and cruising down the Vaal River. Your accommodation will include a crew comprising of a skipper, chef and cleaner, as per your booking requirements. Catered and Self-Catering options are available, depending on your needs. Enjoy a relaxing break with family or friends aboard this luxurious and spacious houseboat accommodation in the Vaal Triangle! 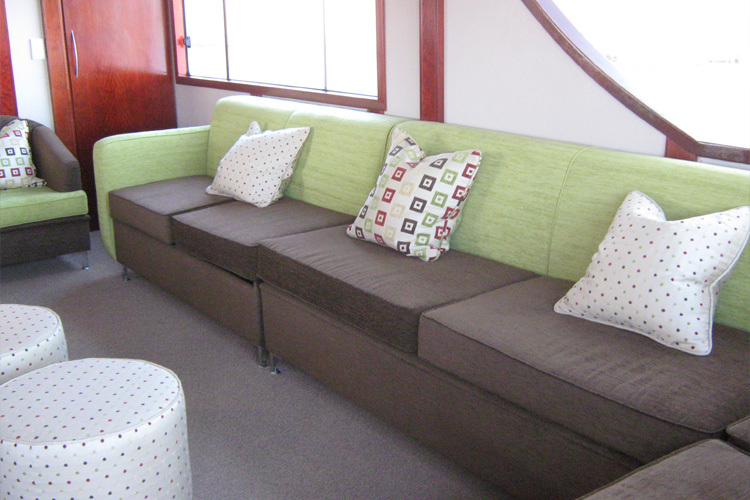 View our rates and information about the Liquid Living houseboat. These two self-catering houseboats offer the perfect weekend getaway for a family of four. Enjoy an amazing river front view whilst staying in this luxurious houseboat accommodation. There are two cabins (en-suite), an open plan kitchen and lounge area inter-leading onto a massive deck with dining table and braai facility. A television with the full DSTV bouquet is available during your stay. The Prive’ and Fluxman Houseboats are moored permanently at the Emerald Marina (they do not cruise), meaning that you are welcome to get off the boat to enjoy some of Emerald Resort & Casino’s facilities. Staying in a houseboat is the experience of a lifetime! 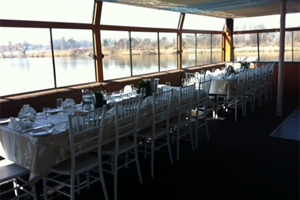 Book your stay in the Vaal Triangle in a luxurious houseboat on the Vaal River, the most unique and memorable accommodation in town! The team at Liquid Lounge will ensure that you have everything you need during your stay. For more information about our accommodation options or to book your stay on a Vaal River houseboat, contact Liquid Lounge today.